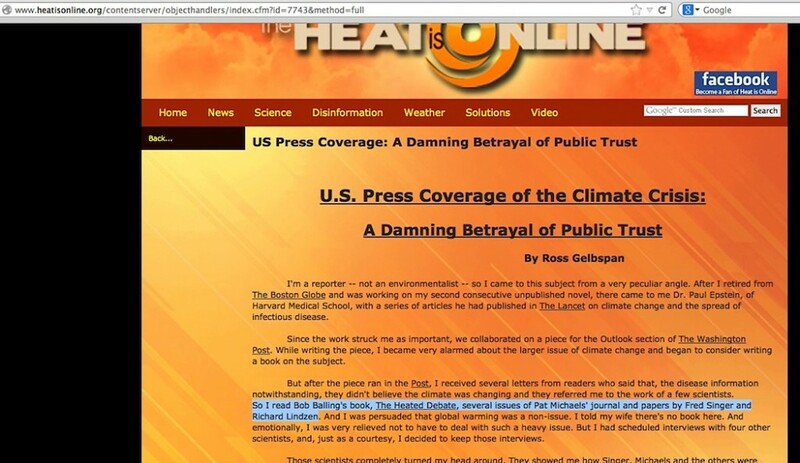 It’s bad enough that Columbia Journalism Review article writer Robert S. Eshelman made the mistake of labeling Ross Gelbspan as a Pulitzer winner (which the CJR later deleted initially without explanation) in his May 1, 2014 piece, but when Eshelman dutifully recited an oft-repeated narrative of how Gelbspan dived into an investigation of ‘corrupt funding of skeptic climate scientists’ – the narrative itself being one plagued with highly questionable contradictions – he basically handed Gelbspan a shovel to dig a deeper credibility hole. 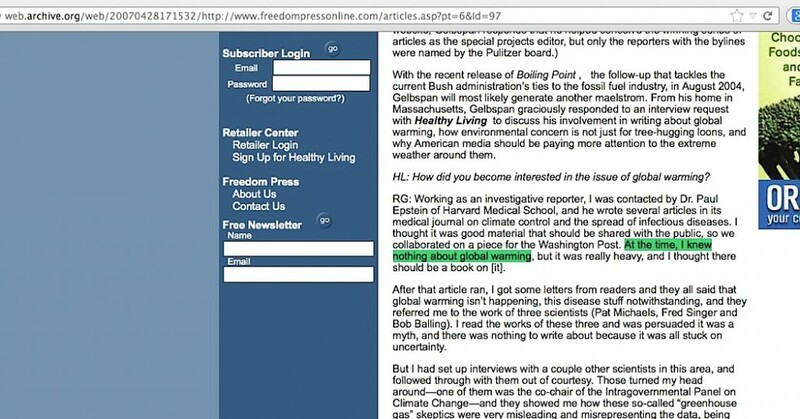 From all accounts, he was a completely retired ex-editor/reporter with no science expertise, minding his own anonymous business, knowing nothing about global warming, (ummm…. 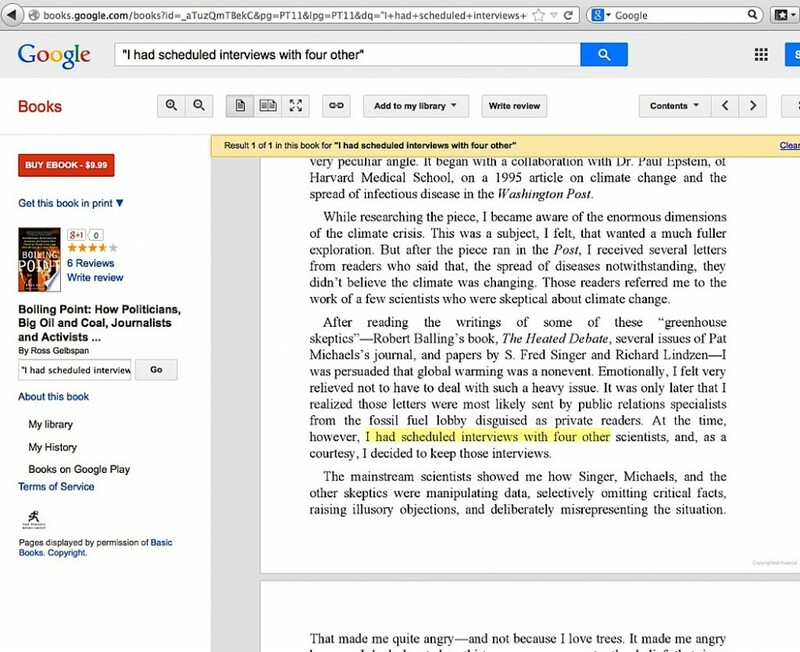 oops), when Harvard’s Dr Paul Epstein approached him in at least the early Spring of 1995 to co-author an article in the Washington Post about how global warming was a factor in spreading diseases. The article was published March 19th. Readers of the article suggested he needed to read the works of a few skeptic climate scientists – specifically either three skeptics or four, depending on which narrative is seen. Afterward, he felt relieved, knowing skeptic scientists had compelling scientific evidence that global warming was not a crisis. But from what he implies was a ‘first time revelation’ of the crisis from Epstein, he intended to learn more about the seriousness of the crisis in order to write more about it, and had already scheduled interviews with four ‘mainstream scientists’. Rather than cancel them, he went ahead with them just to be polite. 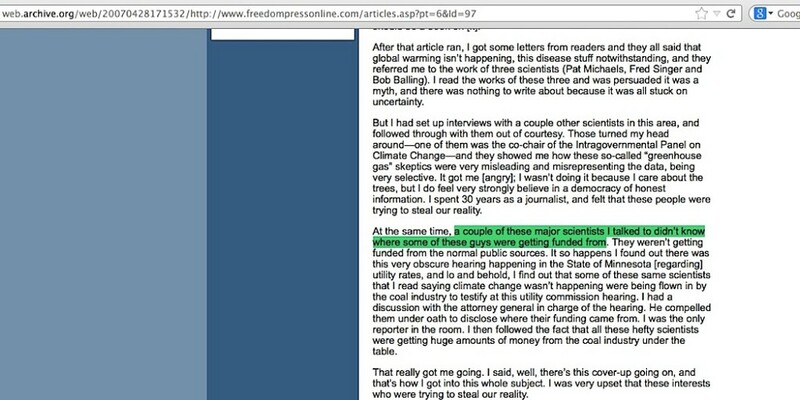 What he gained from the interviews ‘turned his head around’ about skeptics’ climate assessments, while also providing him with a large hint that skeptic scientists’ funding was unknown and therefore from suspect sources, but either a couple of them did this ‘head turning’, or just one of them did, depending on which narrative is seen. 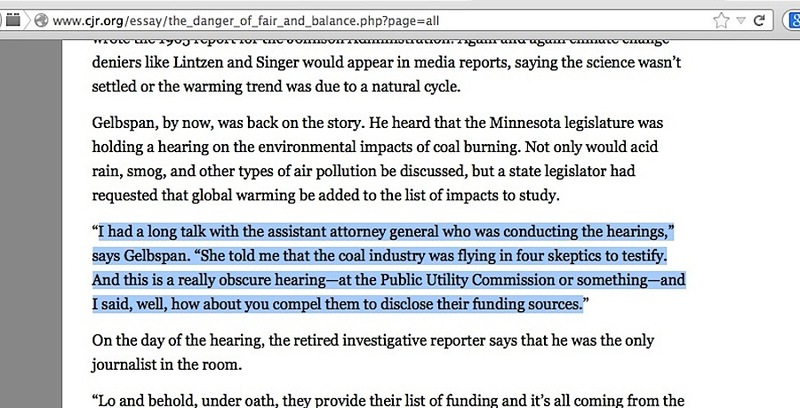 Gelbspan then somehow learned – in one telling, “shortly thereafter” – of a Minnesota Public Utilities Hearing where environmental concerns about coal-fired electricity was to be discussed and skeptic climate scientists were scheduled to testify, but he never discloses in any narrative how he was alerted to it. In another retelling of the story, he simply learned about the hearing and that the skeptic scientists would be compelled to disclose their funding. 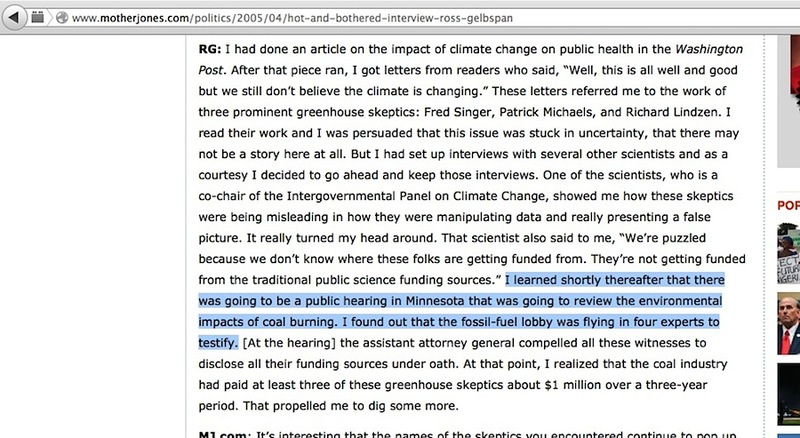 At the hearing, the skeptic scientists were prompted to disclose they received funds from fossil fuel industry organizations, most prominently the Western Fuels Association, and the mere appearance of this situation was enough to convince Gelbspan that the a sinister arrangement between skeptics and industry existed. The timeline of the events above span from the publication of his and Epstein’s WashPo article, March 19, 1995, to the time of the Minnesota hearings he attended, May 22nd – 24th. That’s nine weeks and three days, from literal start-to-finish. Start subtracting time for the initial WashPo reader backlash about skeptic scientists, days or even as much as a week — the timeline for him would stand at March 26th. 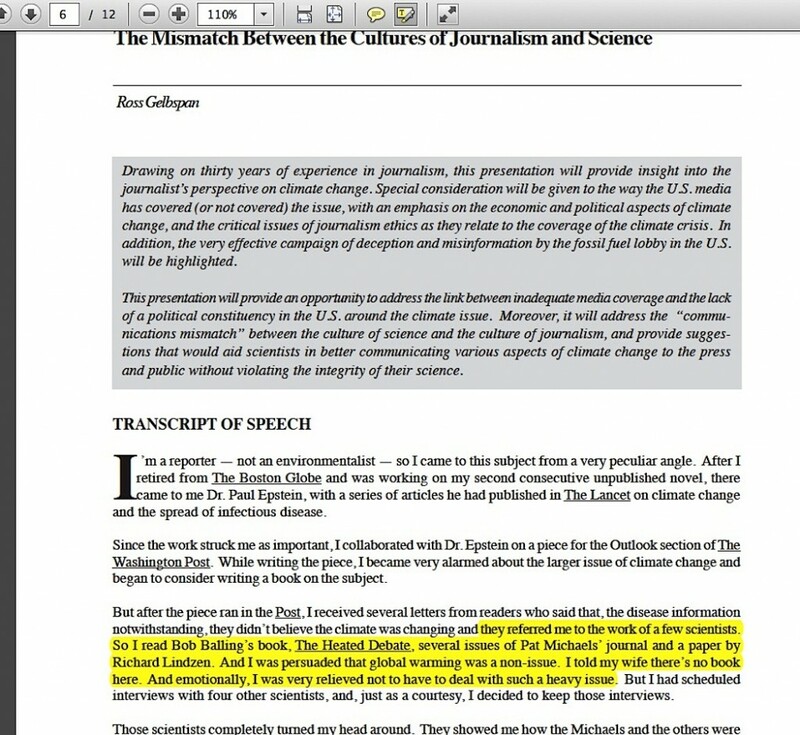 Subtract adequate enough time for Gelbspan to thoroughly read material from skeptics (an entire 195 page book, several multi-page journals and what would have to have been lengthy technical papers in item #2 above). If he was a fast reader, perhaps he could have accomplished that in a week — by April 2nd. Subtract more time after that for the interviews he had with non-skeptic scientists, perhaps another week and a half at minimum — April 13th. Take away at least a few additional days to independently corroborate what those scientists were suggesting about the unknown funding for skeptic scientists — this would place him at a bit past the middle of April 1995, say, April 17th. This approximate date only holds if he accomplished what was required within all the minimum times, leaving him just five weeks and a few days remaining before the skeptics were to appear at the Minnesota hearings. 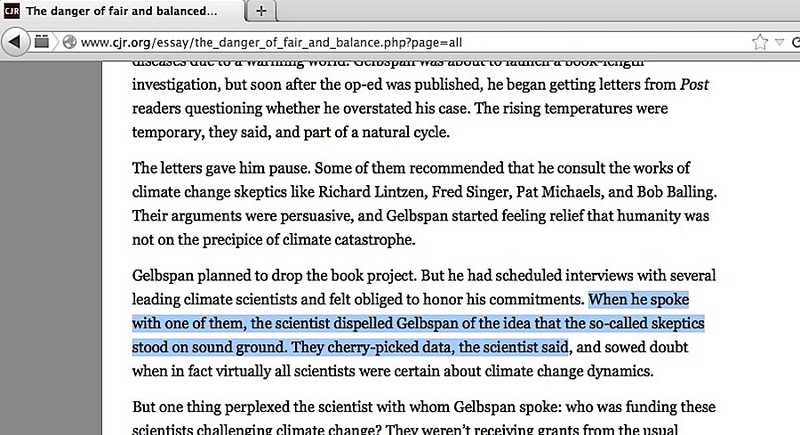 From that point, Gelbspan would have had to somehow figure out who was overseeing the questioning of the skeptics, then how to contact this person in order to arrange a meeting where he would then gain their confidence, so that he could suggest that this man or woman needed to compel the skeptic scientists to disclose their funding. If all of this took longer, he might have only had only two or three weeks to overcome that last hurdle. 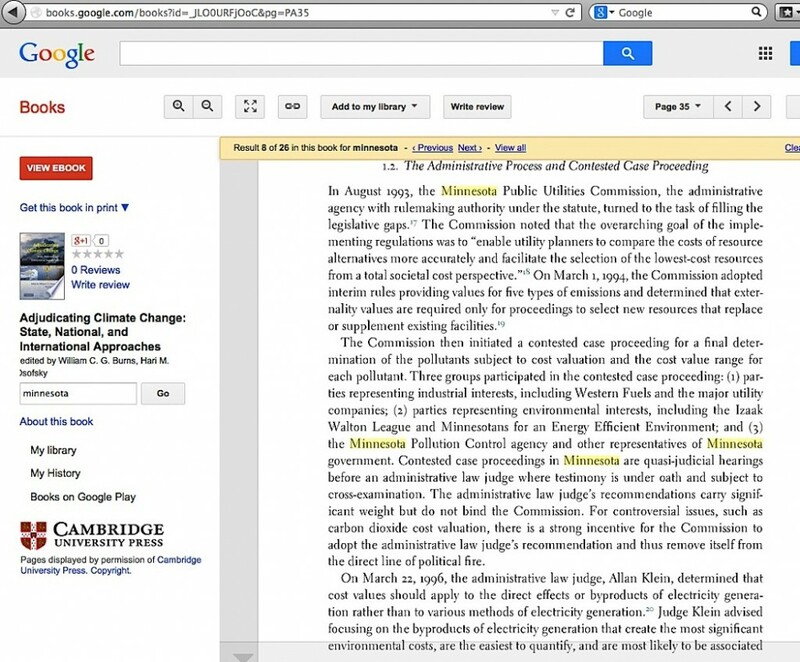 Now, try looking at this from the perspective of an assistant attorney general: With just a few weeks before the skeptics’ oral testimony starts, but otherwise far into a nearly three year-long process of evaluating the costs of power plant emissions, a private citizen, not an employed reporter, having no science expertise, contacts you to say he co-wrote a frightening article about the effects of global warming, but then was temporarily misled by skeptic scientists until a few or just one non-skeptic scientist(s) debunked the skeptics, and now he was suggesting you should ask those same PhD-level skeptics to disclose who funded them, based on no more than a guess that their funding – and by default, their upcoming testimony – was suspect. Would you take this private citizen seriously enough to significantly alter your planned questioning of the skeptics and inform your fellow questioners about this new situation, with that short of a timespan left before their testimony took place? Wouldn’t you instead postpone the oral testimony for months to undertake due diligence on what Gelbspan was saying? That scientist also said to me, “We’re puzzled because we don’t know where these folks are getting funded from. They’re not getting funded from the traditional public science funding sources.” I learned shortly thereafter that there was going to be a public hearing in Minnesota that was going to review the environmental impacts of coal burning. I found out that the fossil-fuel lobby was flying in four experts to testify. [At the hearing] the assistant attorney general compelled all these witnesses to disclose all their funding sources under oath. Back in 2005, Gelbspan was awfully vague about the Minnesota hearing. Combine that now with his CJR narrative last week, and the situation changes drastically, where the assistant attorney general – probably Barbara Freese – apparently tips him about the supposedly ‘suspect’ source of skeptic scientists’ funding. 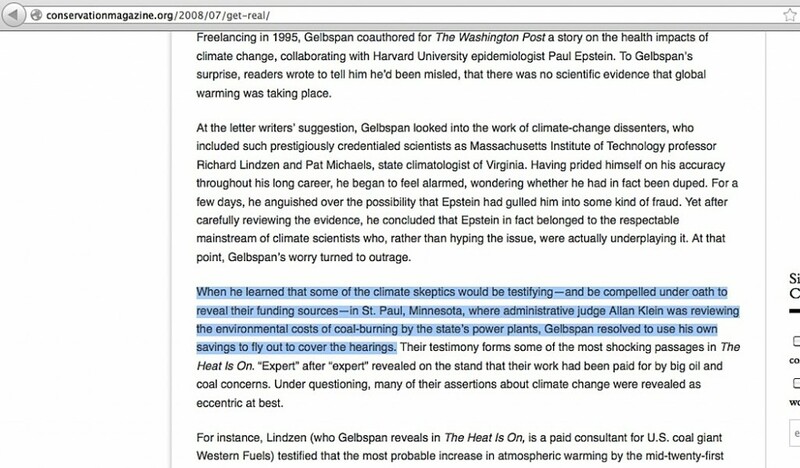 Making matters worse, one narrative has Gelbspan only ‘anguishing for a few days’ after the WashPo reader backlash, then becoming outraged to know ‘mainstream scientists’ were underplaying the issue (with no mention of any interviews with them), then he learned out of thin air about the Minnesota hearing. Consider the complete picture here. 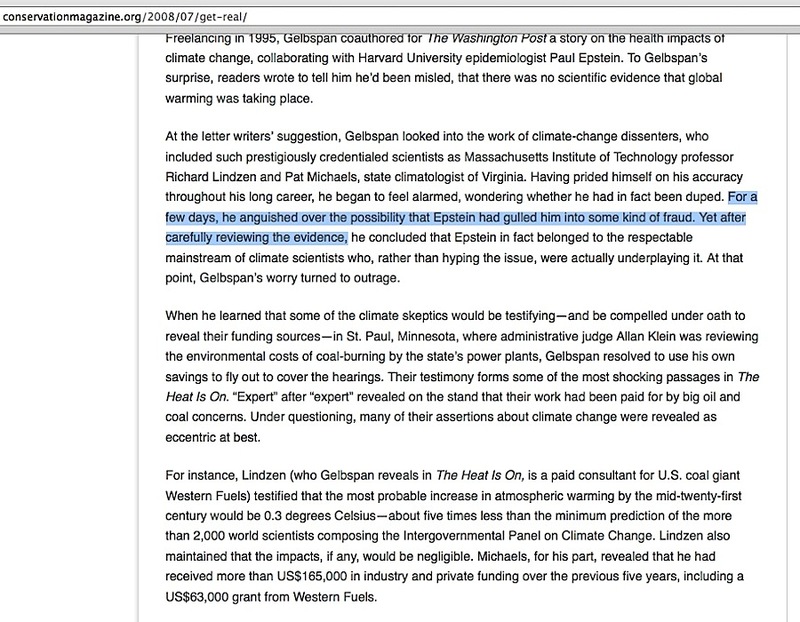 Gelbspan’s second career as an “investigative reporter” exposing the corruption of skeptic scientists began with his odyssey to the May 1995 Minnesota Public Utilities hearing where he “discovered” skeptic climate scientists were corrupted by industry money, and he earned worldwide praise and fame from a Western Fuels Association leaked memo set he ‘obtained’ having a phrase “reposition global warming as theory rather than fact” in it. But he never disclosed exactly how and when he obtained the memo set, nor did he ever publicly show the memos in their full context, and it is a torturous effort to get the details of his Minnesota Public Utilities hearing odyssey to line up right. 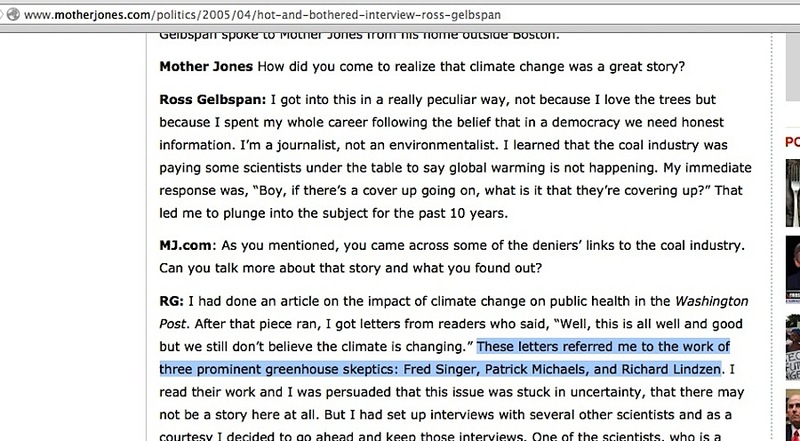 Tie this all together, and what we have is Gelbspan’s central bit of “evidence” not proving a sinister industry directive exists where skeptic climate scientists are paid to lie, and the collective narratives about what led him to investigate skeptics has too short of a timeline to be feasible, with details so inconsistent that it looks more like a fabrication hiding the true details of the entire situation. This entry was posted in Discovery odyssey, Irreconcilable differences, Narrative derailment, Timeline inconsistencies and tagged Barbara Freese, Minnesota Public Utilities Commission hearings, Paul R. Epstein, Western Fuels Association by Russell Cook. Bookmark the permalink.